The jacket hangs in our hall closet. The smell of funnel cakes has finally faded. The blue jacket was part of the uniform worn by my son on one of his first jobs--funnel cake maker at Geauga Lake Park. But it is also a reminder of good times once had at the amusement park not far from where we live. Geauga Lake is all but gone now. I believe the Big Dipper roller coaster has been taken down. It was all that remained to remind those who had enjoyed warm summer days there of the enjoyment the park had brought. 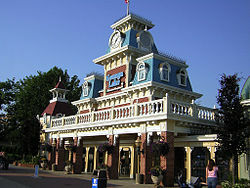 The park, located in Aurora, Ohio, dated back to 1889 and went through several transitions as ownership changed. One of the favorites was when Sea World opened up across from the amusement rides on the other side of the lake. Shamu, the sea lions and of course the dolphins brought a day filled with wonder and education. The amusement rides of Geauga Lake included not only roller coasters but more nostalgic rides like the old fashioned cars that ran on a rail. How many of us remember our first driving experience on that track when your parent had to push the gas pedal because you couldn't reach it? But alas, Sea World is gone. Geauga Lake Park is gone and even the water park that ran a few more years is gone. What will replace it can only be imagined. Many though will pass by and say, "Remember when. . .?"